Self-steer narrow boat day hire- no experience required. Do you dream of escaping the hustle and bustle of daily life? Do you yearn for an escape, a slower pace, shared with family or friends? If so, why not consider booking a day on Phoenix? Phoenix started her life as live aboard narrowboat. In the mid 2000’s, most unfortunately, she was vandalised and set on fire. The subsequent sinking would have meant the end for most boats, but not for Phoenix. The previous owners re-floated the vessel, repaired the damage and undertook modifications to turn her into a day hire boat. Phoenix didn’t exactly rise from the ashes, she rose from the mud! 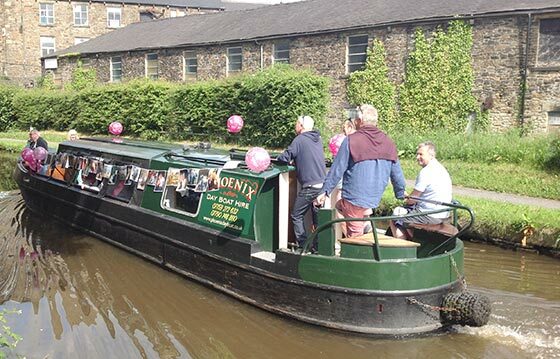 For more information about Phoenix please view the Narrow Boat Phoenix page. The Upper Peak Forest canal winds its way from Whaley Bridge to Marple. Lock free up to this point it’s a scenic stretch , totally unspoilt. The scenery varies. There are wooded sections and open areas with views to farmland and the peaks. Lock free throughout its length but you’ll have the opportunity to operate 2 swing bridges and 2 ancient lift bridges, should you cruise as far as Strines. We cater for parties of up to 12 people. 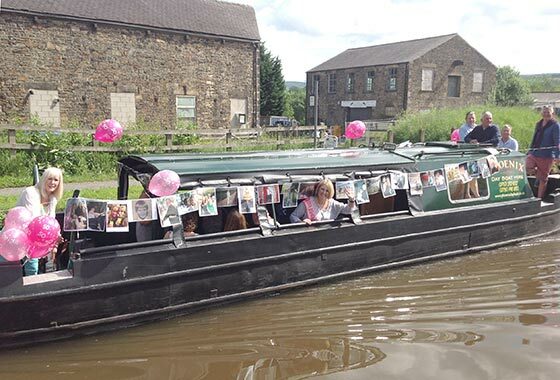 The boat is popular with families, groups of friends, canal enthusiasts and corporate groups. We also cater for supervised groups including special needs whether it be a one off trip or regular booking; we can tailor trips accordingly. You can bring your dog with you, there’s no additional charge. All we ask is that no additional cleaning is required at the end of the trip. Stag and hen parties and must must be steered by our qualified captain who we will provide at extra cost, get in touch for details and availability. I hope you enjoy reading the pages on this site and look forward to hearing from you.